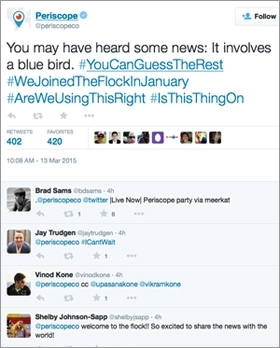 Twitter on Friday confirmed the acquisition of live-streaming app Periscope. Financial terms of the deal were not disclosed, but previous reports put the sale at somewhere $50 million to $100 million. Fittingly, Periscope confirmed to the deal in a tweet, on Friday. “You may have heard some news: It involves a blue bird,” the company’s official Twitter account quipped. Video is clearly a priority for Twitter. Despite its promise, Twitter only recently introduced a video platform. Videos can be 30 seconds long and be uploaded, edited and shared directly from Twitter’s flagship platform. At least on the surface, rivals say they welcome increased competition from Twitter and other video newcomers. At a recent industry event, Robert Kyncl, YouTube’s head of content, estimated the digital video market to be worth between $200 billion and $400 billion -- more than enough to go around, he said. 2 comments about "Twitter Buys Periscope App, Video A Priority". Nate Wiener from Lexus, March 16, 2015 at 3:13 p.m.
james morgan from Fuisz Media, March 19, 2015 at 7:21 p.m.
At what event did Kyncl mention "estimated the digital video market to be worth between $200 billion and $400 billion -- more than enough to go around"?